Background: Women who develop secondary arm lymphoedema subsequent to treatment associated with breast cancer require life-long management for a range of symptoms including arm swelling, heaviness, tightness in the arm and sometimes the chest, upper body impairment and changes to a range of parameters relating to quality of life. While exercise under controlled conditions has had positive outcomes, the impact of yoga has not been investigated. The aim of this study is to determine the effectiveness of yoga in the physical and psycho-social domains, in the hope that women can be offered another safe, holistic modality to help control many, if not all, of the effects of secondary arm lymphoedema. Methods and design: A randomised controlled pilot trial will be conducted in Hobart and Launceston with a total of 40 women receiving either yoga intervention or current best practice care. Intervention will consist of eight weeks of a weekly teacher-led yoga class with a home-based daily yoga practice delivered by DVD. Primary outcome measures will be the effects of yoga on lymphoedema and its associated symptoms and quality of life. Secondary outcome measures will be range of motion of the arm and thoracic spine, shoulder strength, and weekly and daily physical activity. Primary and secondary outcomes will be measured at baseline, weeks four, eight and a four week follow up at week twelve. Range of motion of the spine, in a self-nominated group, will be measured at baseline, weeks eight and twelve. A further outcome will be the women抯 perceptions of the yoga collected by interview at week eight. 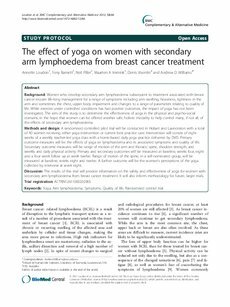 Discussion: The results of this trial will provide information on the safety and effectiveness of yoga for women with secondary arm lymphoedema from breast cancer treatment. It will also inform methodology for future, larger trials.